Welcome to the official homepage of Sue Holdaway, glass designer. 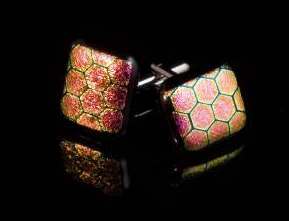 On this page you can view examples of the wide range of custom-made jewellery Sue provides, along with options to purchase and order specific pieces of this unique craft. If you're unsure as to what to expect, the simplest way to get a feel for Sue's work is to take a look at the jewellery ranges page and explore the ranges. If you have any questions regarding the jewellery or orders, or wish to contact Sue with regards to a viewing, you can contact her by emailing sue@sueholdaway.com or using the contact page. This website is constantly being updated with new additions to the range, so be sure to check back frequently for updates. Thank you for your interest, and we hope you enjoy the site! 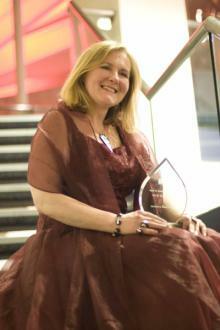 November 2007: Sue has been named winner of the Sir Paul Smith Award for Design and Creativity 2007! The award recognises Sue's creativity, originality, and design flair. 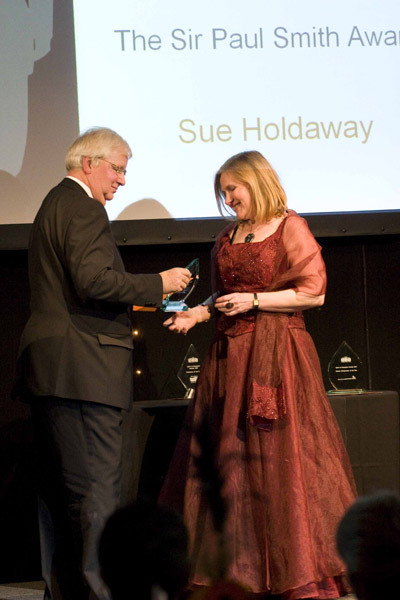 You can click here to see another photo of Sue receiving her award. The website has also been updated to reflect the different ranges available, along with pricing estimates and a wider gallery of samples. Please click the 'Jewellery Ranges' link on the menu to see the pieces, and 'Purchase & Commissions' to learn more about buying your own piece of unique jewellery. Sue has also been selected to exhibit at Design Edge Trade Fair this month! Similarly, website updates include some further examples of Sue's work and an updated biography - please use the menu to explore these further. "My fascination with glass dates back to beach combing sea-tumbled glass as a child and the up-lifting experiences of entering a darkened church and discovering the treasures of a beautiful stained glass window."